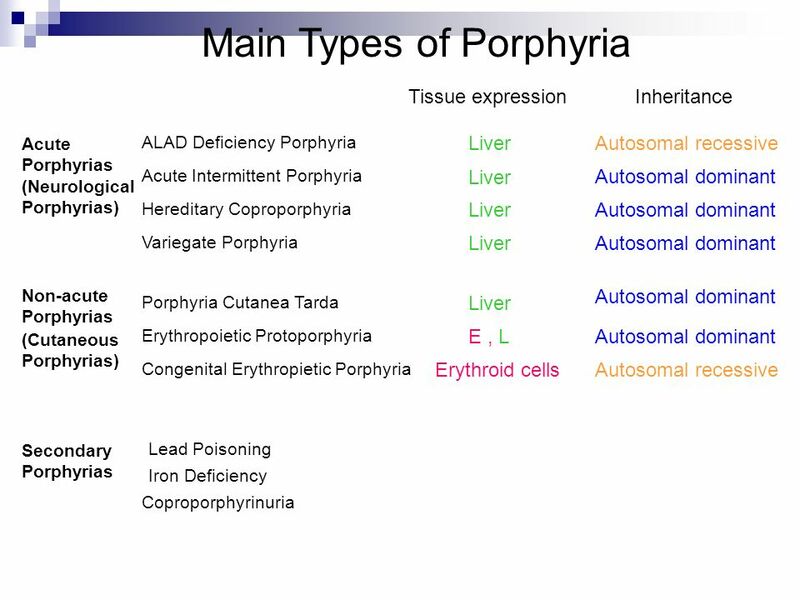 Hepatic Porphyrias (normal RBC Porphyrins) Erythropoietic Porphyrias ( RBC Porphyrins) Acute Intermittent Porphyria (AIP) Congenital Erythropoietic Porphyria (CEP) Variegate porphyria (VP) Erythropoietic Protoporphyria (EP) Hereditary Coproporphyria (HCP) Porphyria Cutanea Tarda (PCT) Presentation: Porphyrias Tests to order Sample Acute symptoms AIP 1. 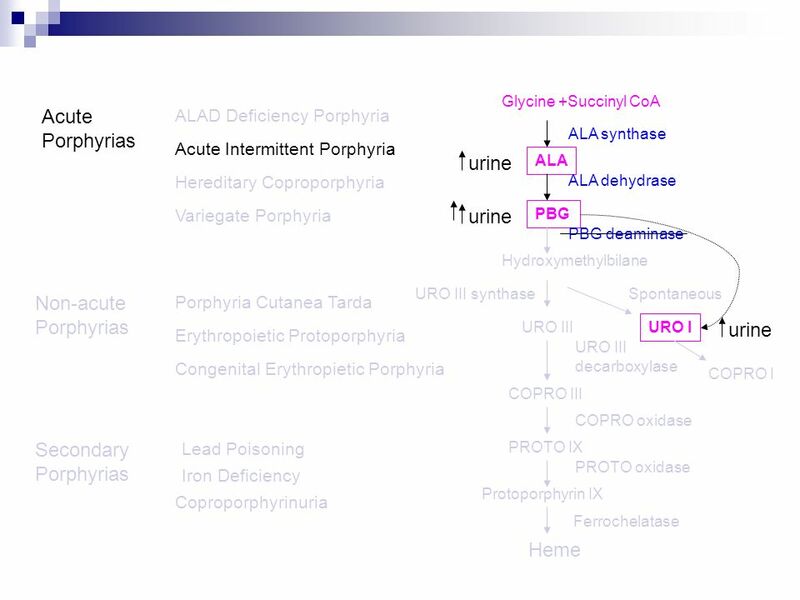 Urine Porphyrin Precursors Screen & Quantitation Random (50 ml) or 24-h with Tartaric acid Acute symptoms + skin lesions (may occur independently) VP HCP 2. 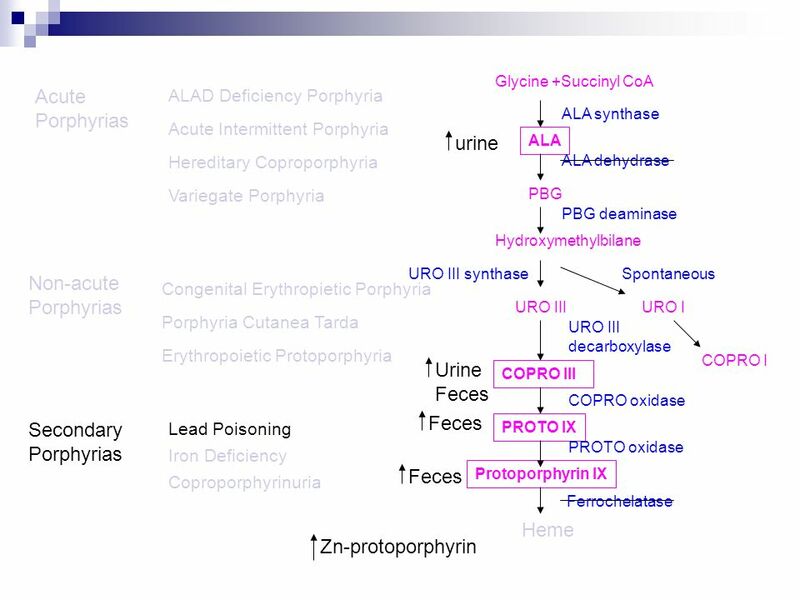 Feces Porphyrins Screen & Quantitation Random Skin lesions PCT CEP EP 3. 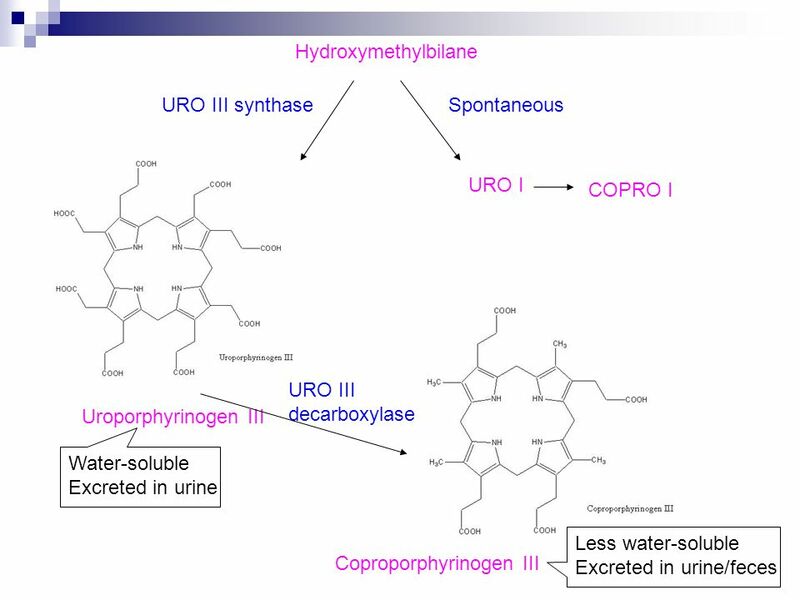 Urine Porphyrins Screen & Quantitation 4. 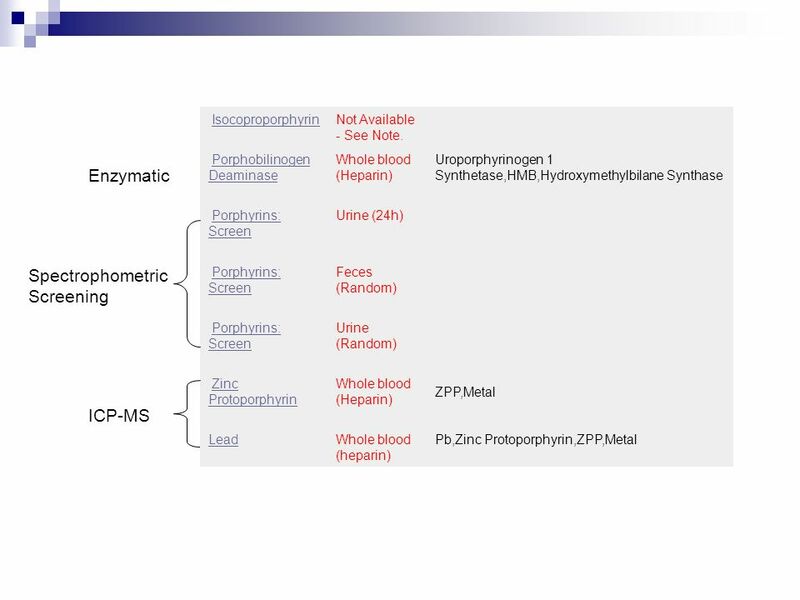 RBC Porphyrins Screen & Quantitation Random (50 ml) or 24-h with Na2CO3 Lavender-top (EDTA) blood; need Hct Notes: At time of acute attack: 1. 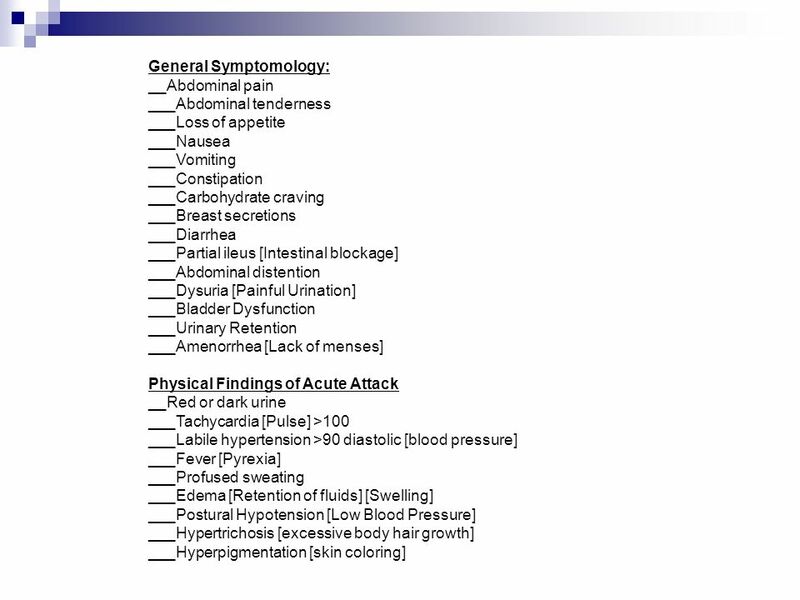 Collect a random urine sample first (50 ml with no preservatives), before attempting to collect a 24-h sample. 2. 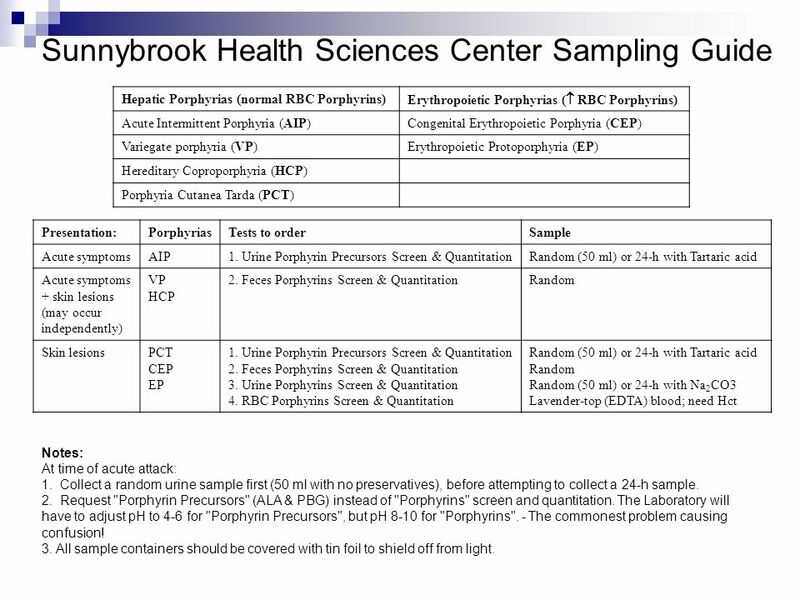 Request "Porphyrin Precursors" (ALA & PBG) instead of "Porphyrins" screen and quantitation. 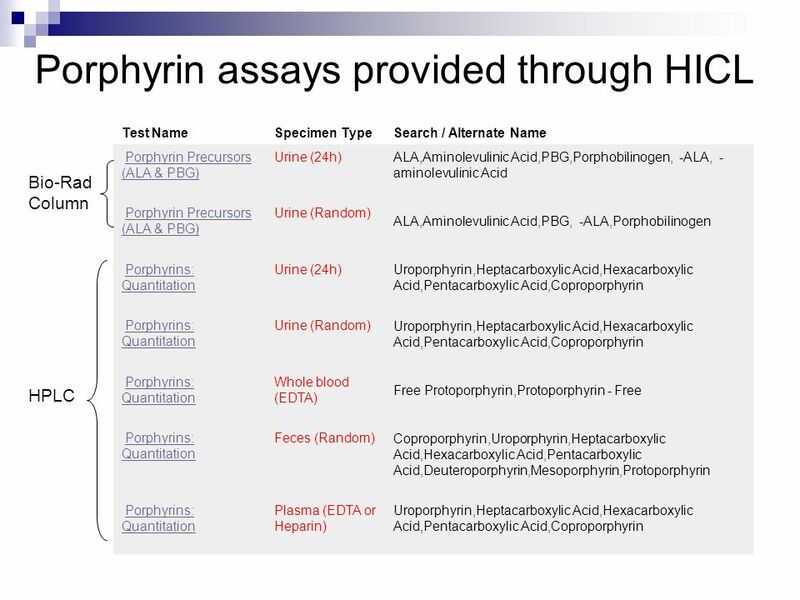 The Laboratory will have to adjust pH to 4-6 for "Porphyrin Precursors", but pH 8-10 for "Porphyrins". - The commonest problem causing confusion! 3. All sample containers should be covered with tin foil to shield off from light. 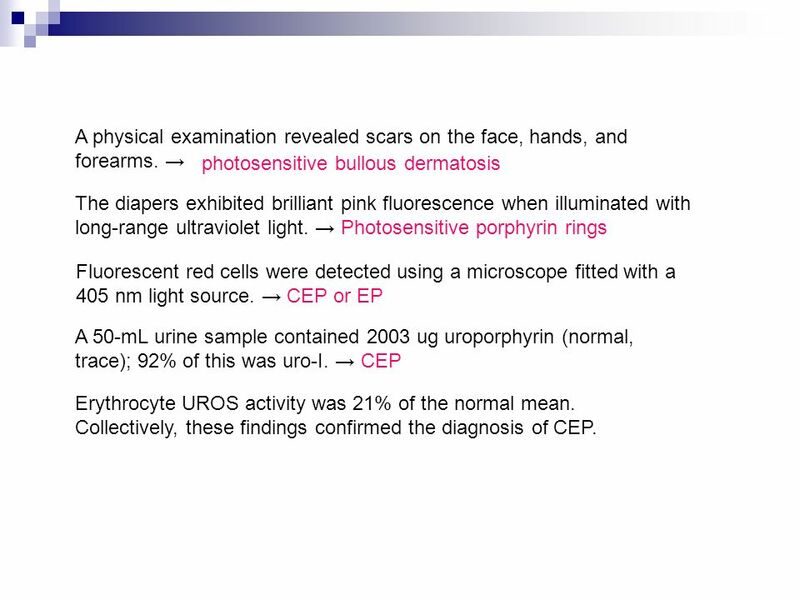 photosensitive bullous dermatosis The diapers exhibited brilliant pink fluorescence when illuminated with long-range ultraviolet light. 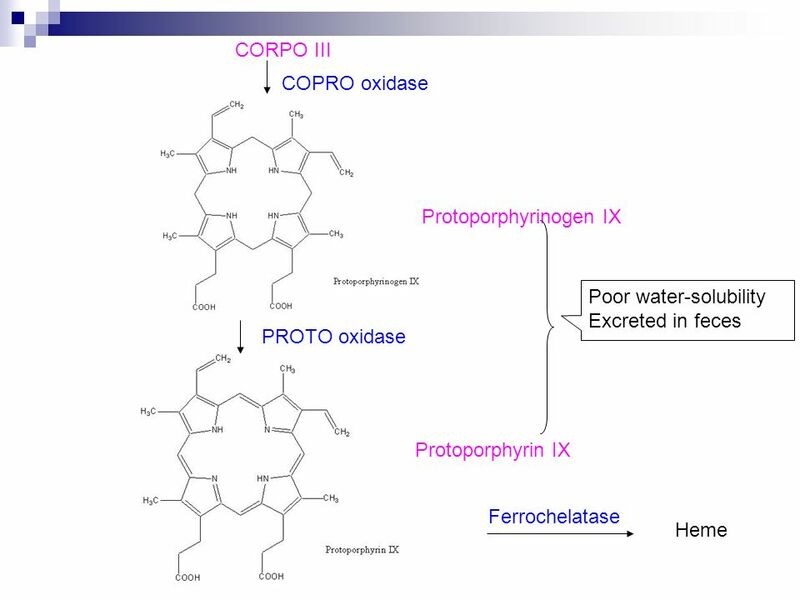 → Photosensitive porphyrin rings Fluorescent red cells were detected using a microscope fitted with a 405 nm light source. 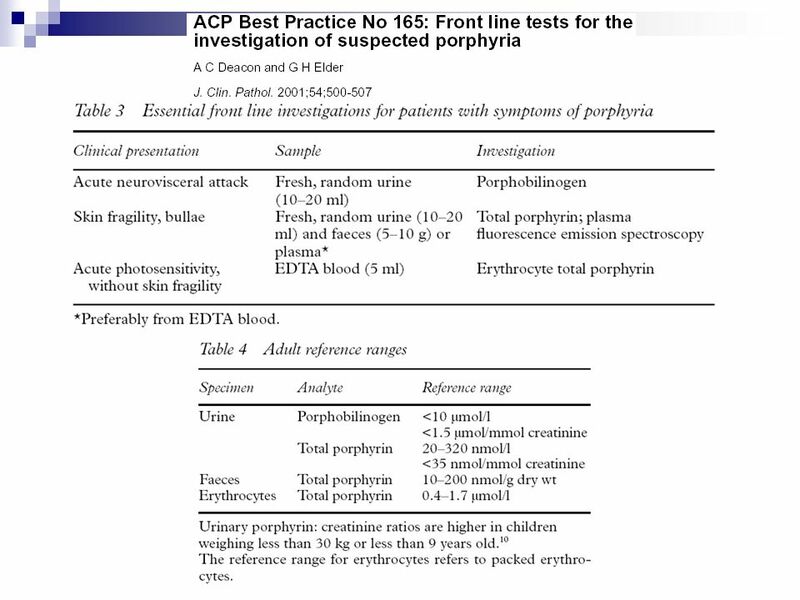 → CEP or EP A 50-mL urine sample contained 2003 ug uroporphyrin (normal, trace); 92% of this was uro-I. 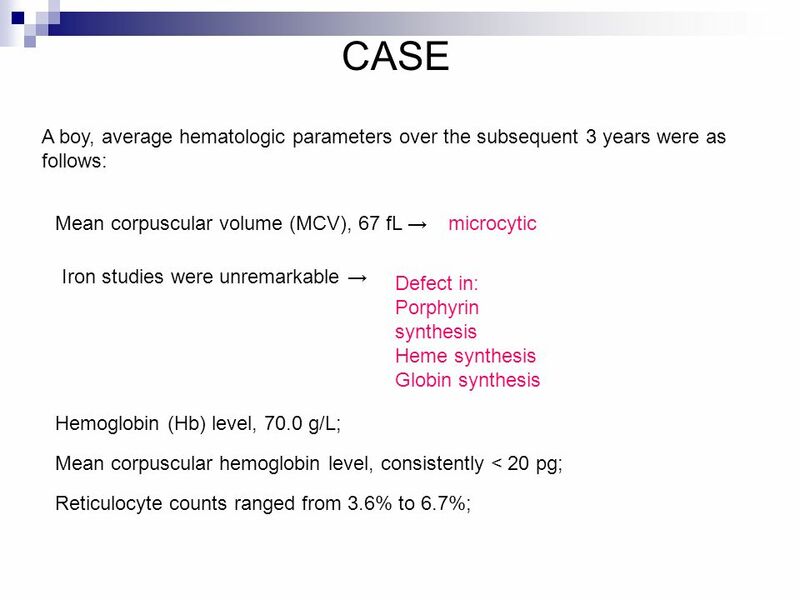 → CEP Erythrocyte UROS activity was 21% of the normal mean. 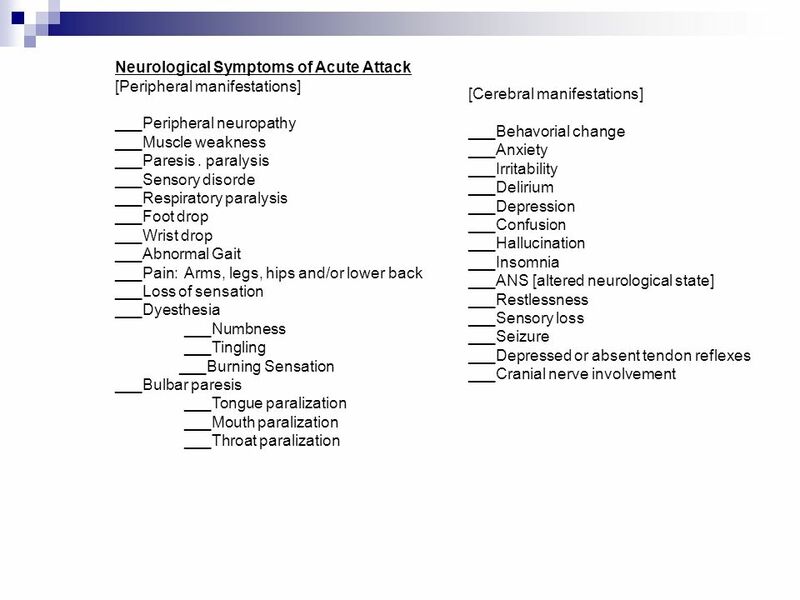 Collectively, these findings confirmed the diagnosis of CEP. 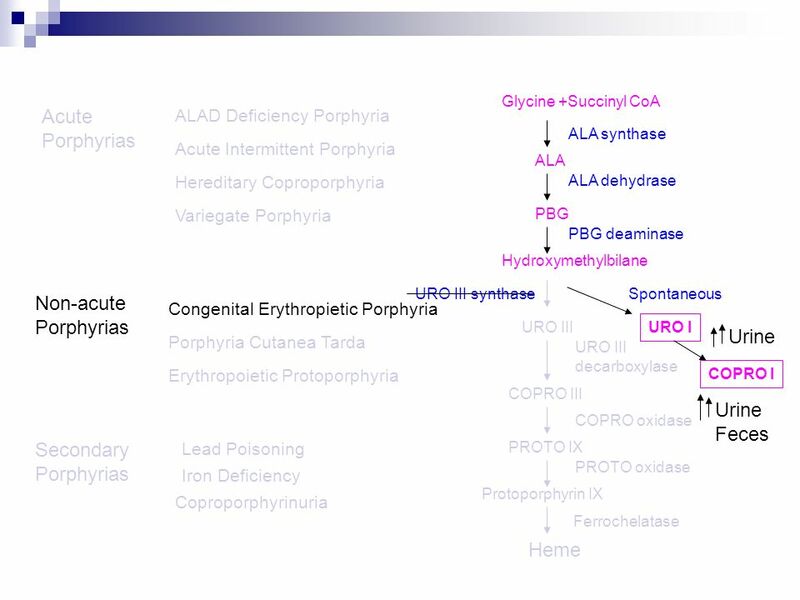 28 Erythrocyte UROS activity was normal in both parents, an unexpected finding as obligate carriers (heterozygotes) for UROS mutations generally have half-normal enzymatic activity. 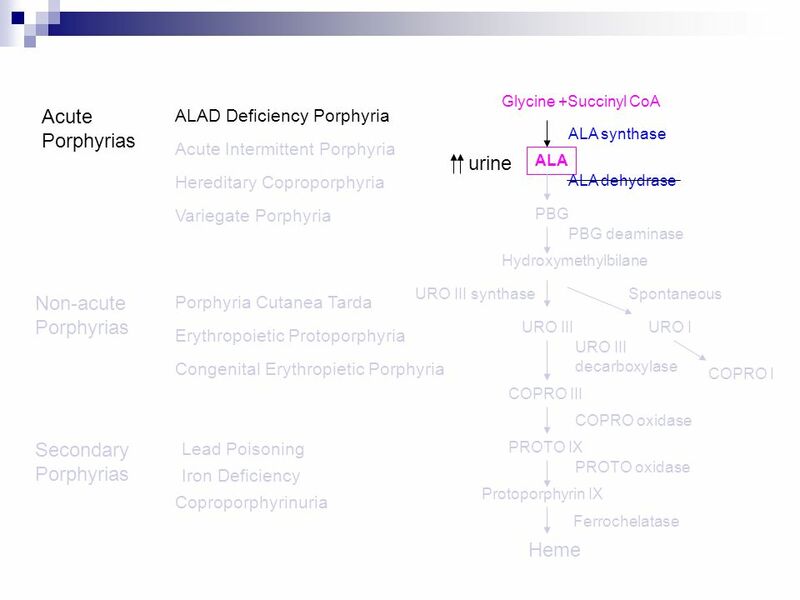 UROS was sequenced, and no mutations or deletions were found in the child or the parents. A GATA1 point mutation was found in the child at codon 216, changing arginine to tryptophan (R216W), as well as on 1 of the 2 GATA1 alleles of his mother and maternal grandmother. 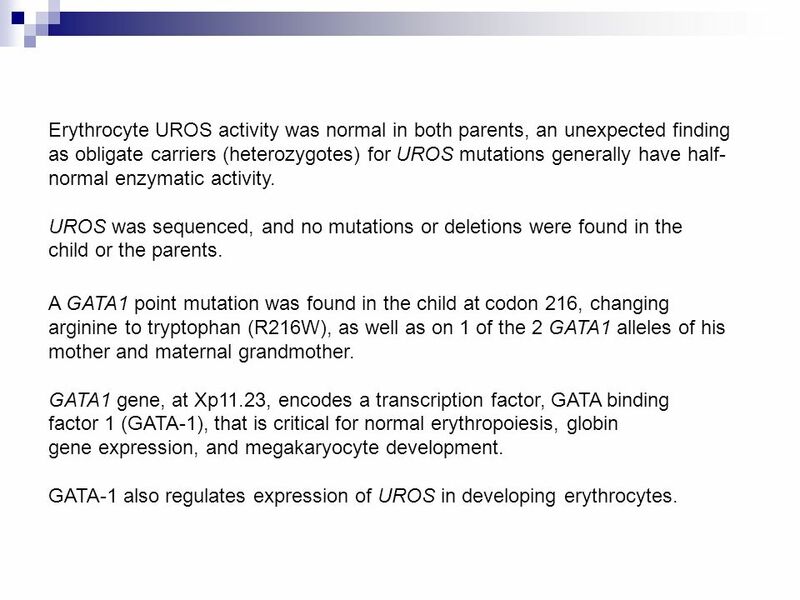 GATA1 gene, at Xp11.23, encodes a transcription factor, GATA binding factor 1 (GATA-1), that is critical for normal erythropoiesis, globin gene expression, and megakaryocyte development. 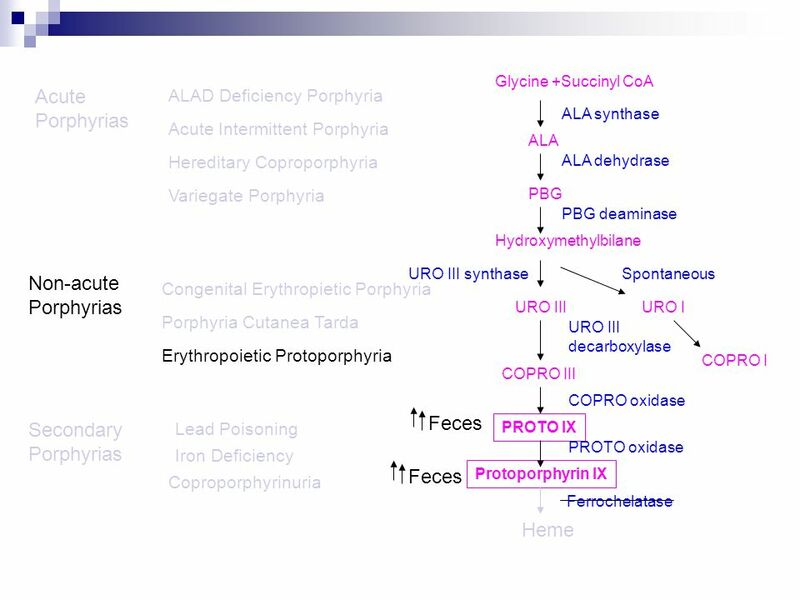 GATA-1 also regulates expression of UROS in developing erythrocytes. 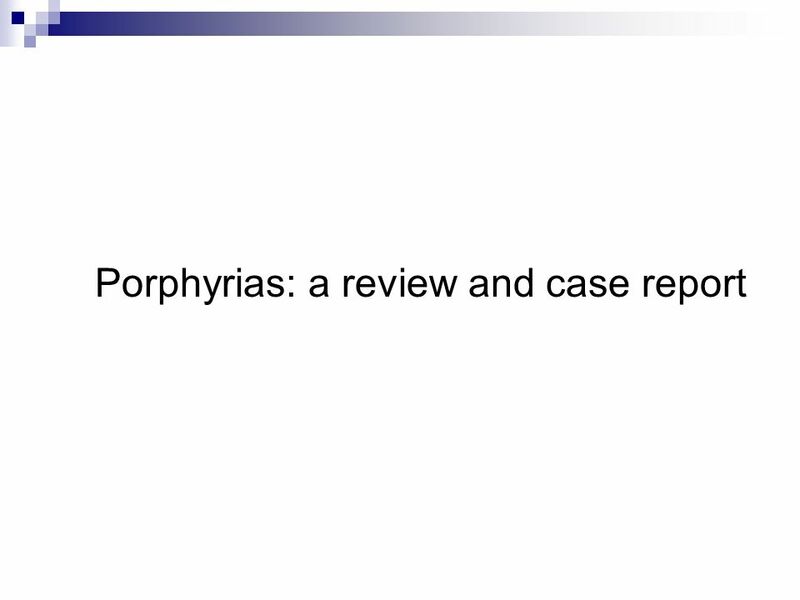 Download ppt "Porphyrias: a review and case report"
HEMATOLOGY WHAT IT IS : Study & measurement of individual elements of Blood. WHAT IT’S COMPOSED OF. 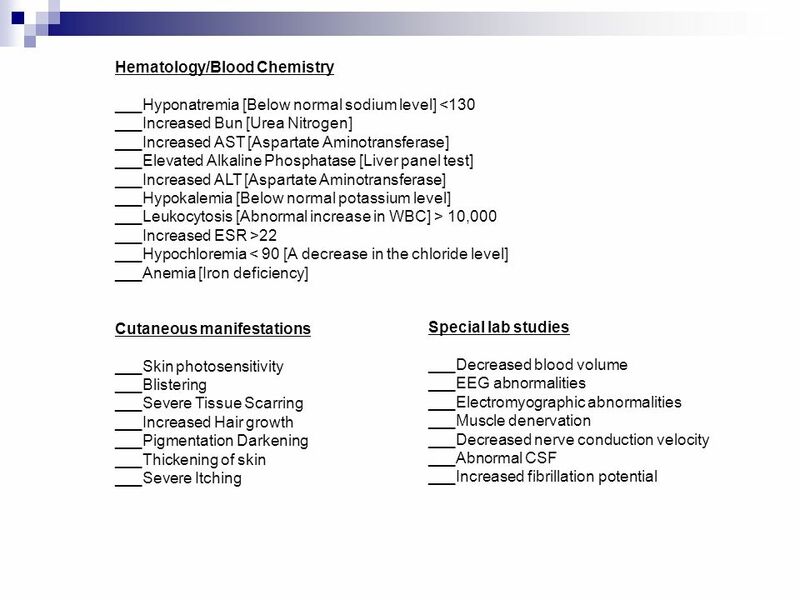 SHOW SLIDES FROM PERIPHERAL BLOOD TUTOR CD OR USE PLATE. 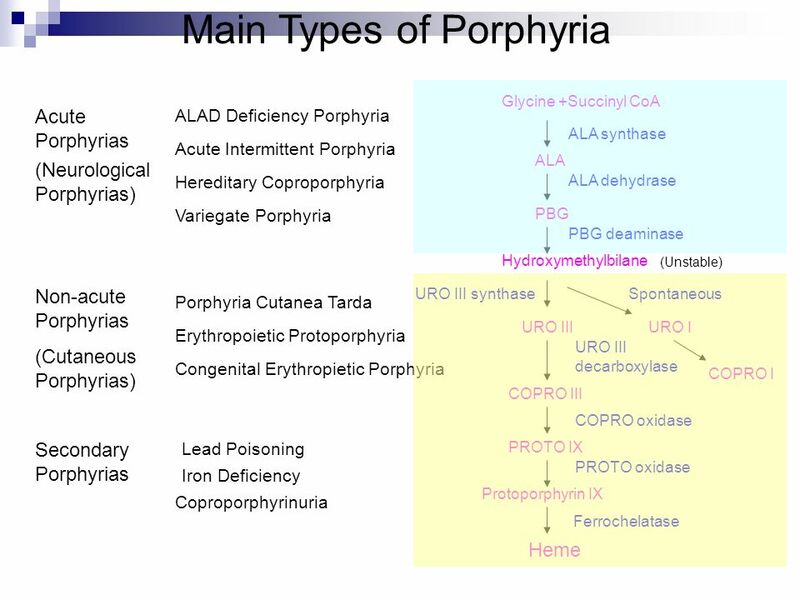 Porphyrias and Errors In Heme Metabolism By: Maria Moreno, Jin-Hee Park, Seo Youn Kim and Newton Wong September 23, 2014 PHM142 Fall 2014 Instructor: Dr.
Synthesis of Heme Copyright © by Joyce J. Diwan. All rights reserved. 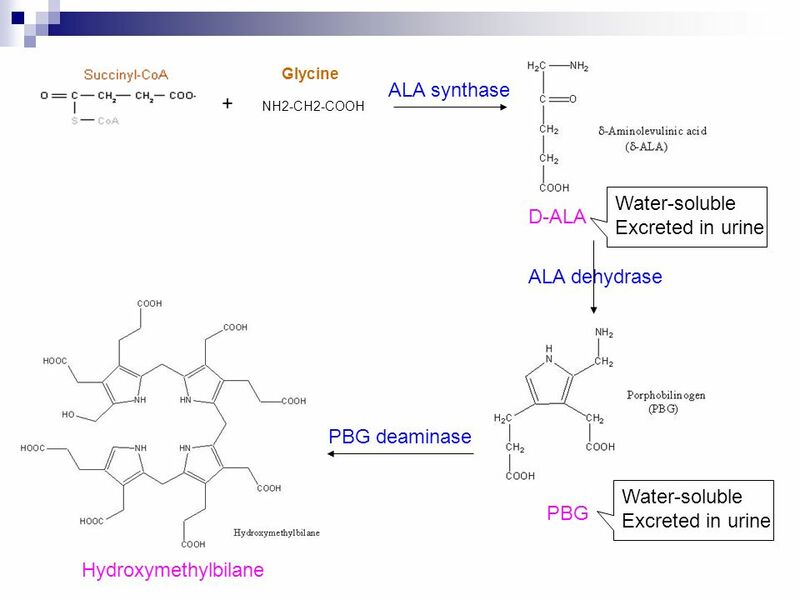 Molecular Biochemistry II. 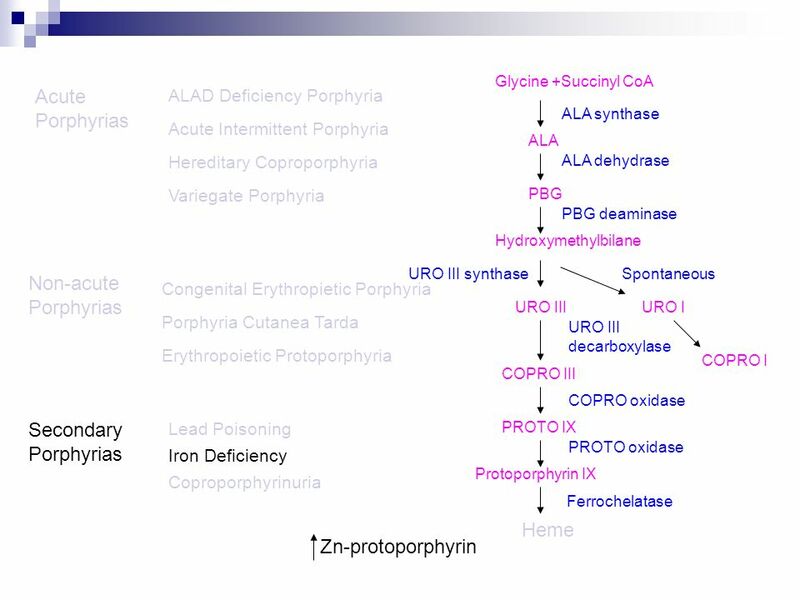 HEME SYNTHESIS Prof.Dr.Arzu SEVEN. 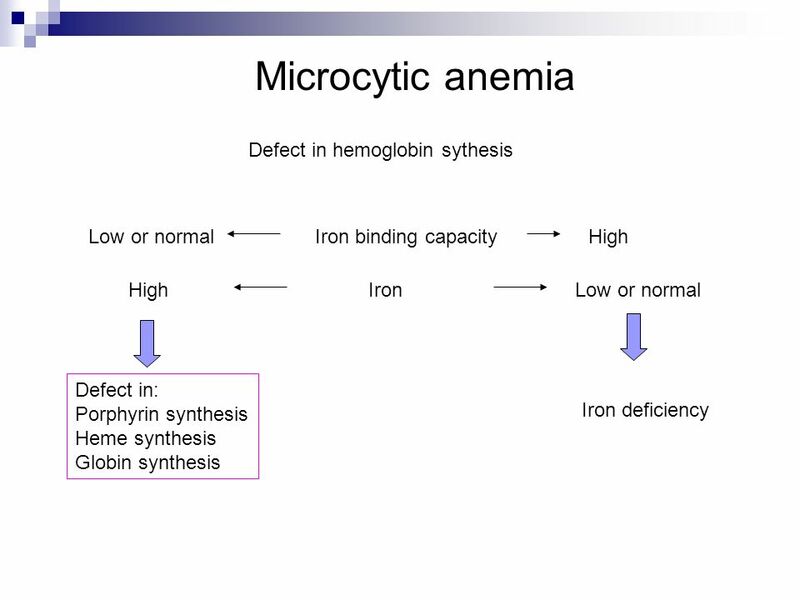 HEME SYNTHESIS Heme is synthesized from porphyrins and iron. 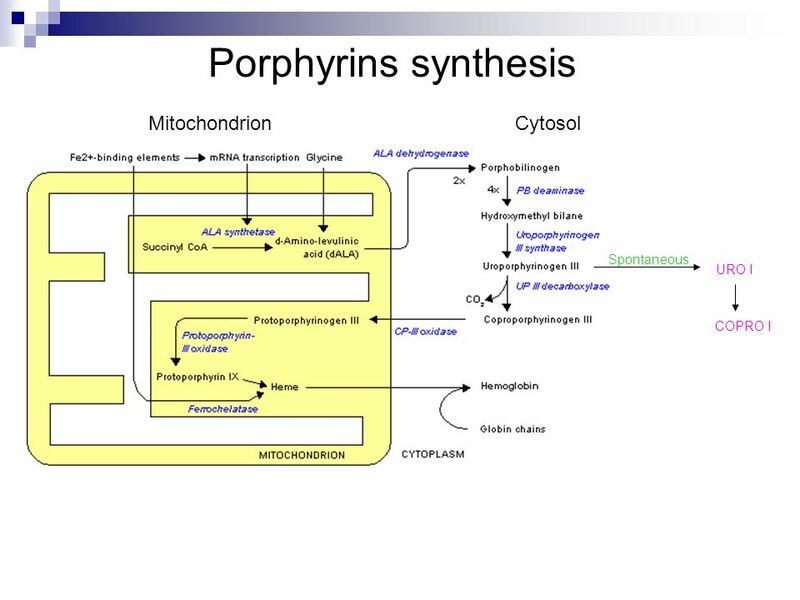 Porphyrins are cyclic compounds formed by the linkage. 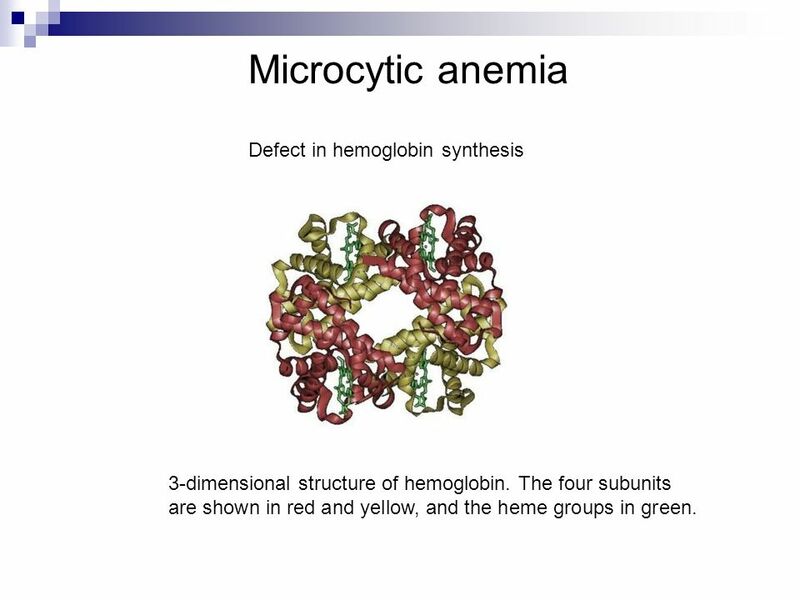 Dental Biochemistry Lectures 39 and HEME AND HEMOGLOBIN Michael Lea. 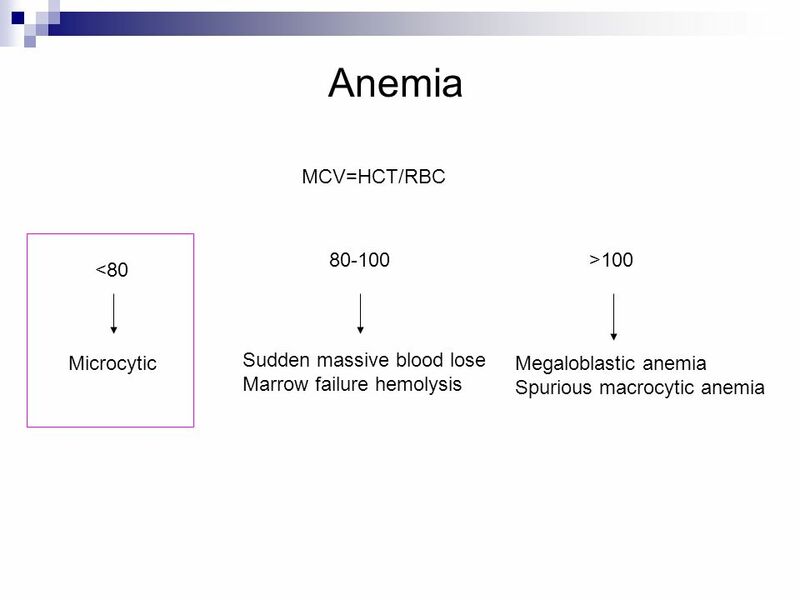 Thalassemia Dr.Alireza Nikanfar Hematology and oncology research center of Tabriz University of Medical Sciences. 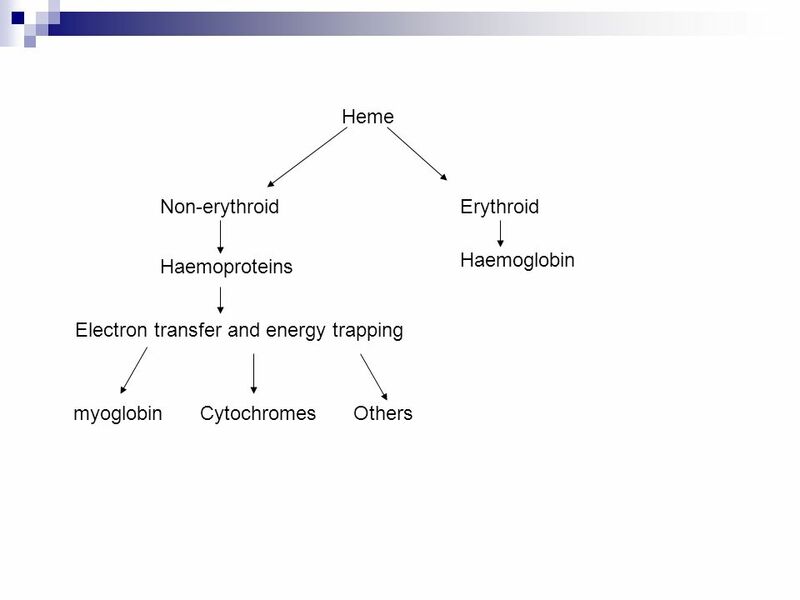 Iron and heme metabolism © Michael Palmer Functions of heme Redox chemistry ● electron transport: cytochromes in the respiratory chain ● enzyme. 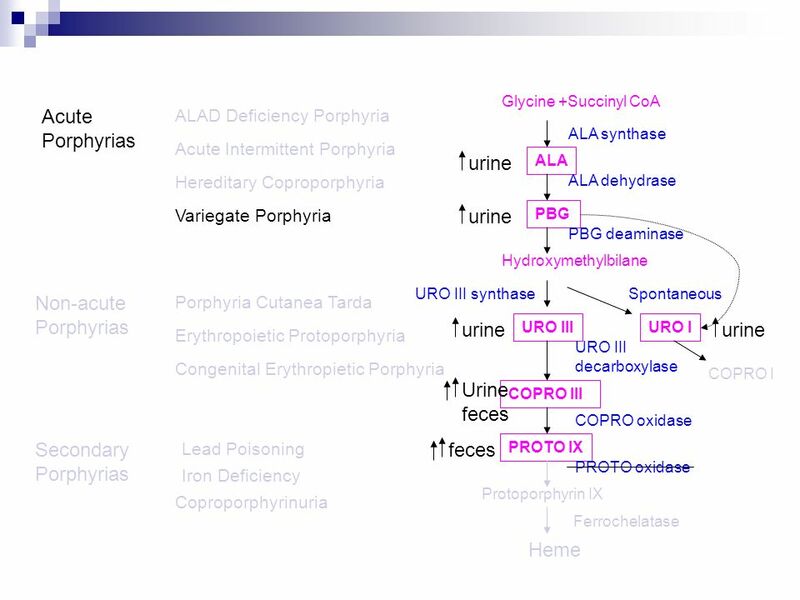 TISSUES :- ALL TISSUES BUT PREDOMINANTLY IN THE LIVER AND BONE-MARROW SUBCELLULAR SITE :- PARTLY IN MITOCHONDRION ( FIRST STEP AND THE LAST THREE STEPS. Section 8. 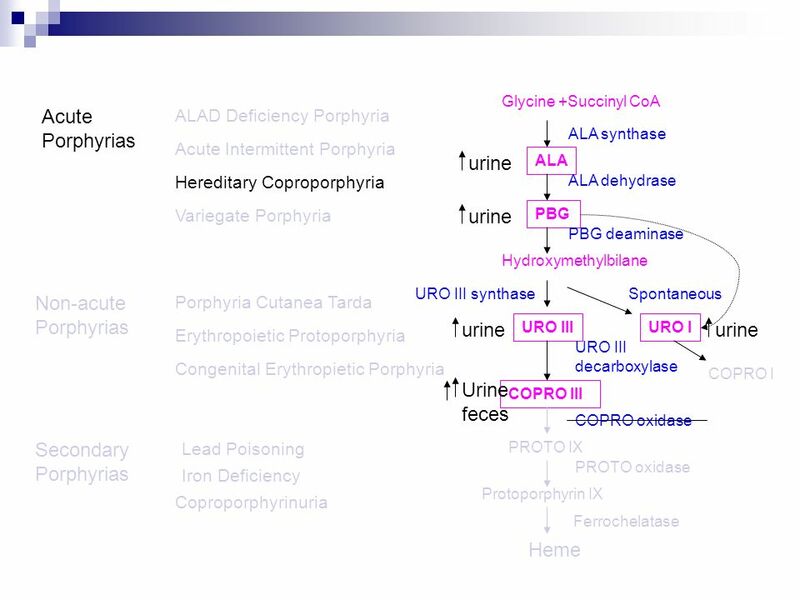 Amino Acid Metabolism Porphyrins, heme, bile pigments 11/22/04. 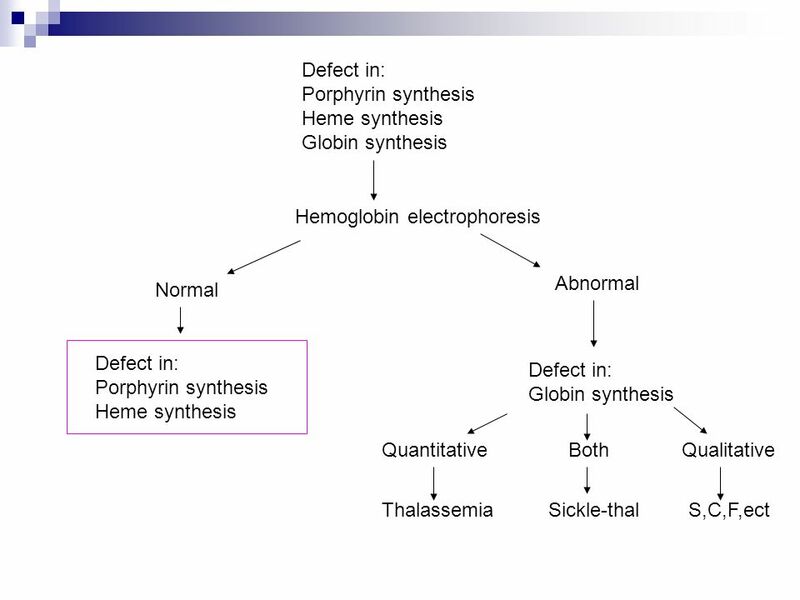 Pathophysiology of Heme Synthesis Beth A. Bouchard BIOC 212: Biochemistry of Human Disease Spring 2006.